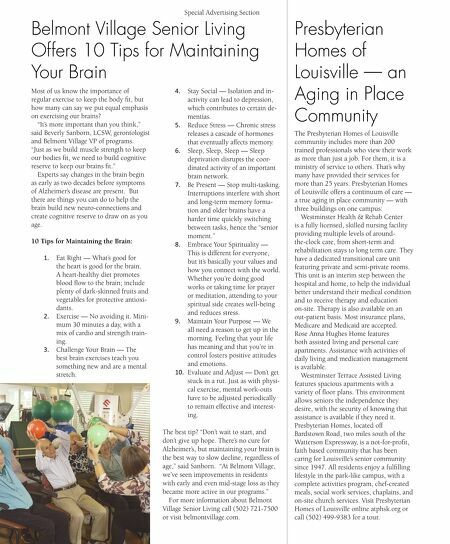 Special Advertising Section Belmont Village Senior Living Offers 10 Tips for Maintaining Your Brain Most of us know the importance of regular exercise to keep the body ft, but how many can say we put equal emphasis on exercising our brains? "It's more important than you think," said Beverly Sanborn, LCSW, gerontologist and Belmont Village VP of programs. "Just as we build muscle strength to keep our bodies ft, we need to build cognitive reserve to keep our brains ft." Experts say changes in the brain begin as early as two decades before symptoms of Alzheimer's disease are present. But there are things you can do to help the brain build new neuro-connections and create cognitive reserve to draw on as you age. 10 Tips for Maintaining the Brain: 1. 2. 3. Eat Right — What's good for the heart is good for the brain. A heart-healthy diet promotes blood fow to the brain; include plenty of dark-skinned fruits and vegetables for protective antioxidants. Exercise — No avoiding it. Minimum 30 minutes a day, with a mix of cardio and strength training. Challenge Your Brain — The best brain exercises teach you something new and are a mental stretch. 4. Stay Social — Isolation and inactivity can lead to depression, which contributes to certain dementias. 5. Reduce Stress — Chronic stress releases a cascade of hormones that eventually affects memory. 6. Sleep, Sleep, Sleep — Sleep deprivation disrupts the coordinated activity of an important brain network. 7. Be Present — Stop multi-tasking. Interruptions interfere with short and long-term memory formation and older brains have a harder time quickly switching between tasks, hence the "senior moment." 8. Embrace Your Spirituality — This is different for everyone, but it's basically your values and how you connect with the world. Whether you're doing good works or taking time for prayer or meditation, attending to your spiritual side creates well-being and reduces stress. 9. Maintain Your Purpose — We all need a reason to get up in the morning. Feeling that your life has meaning and that you're in control fosters positive attitudes and emotions. 10. Evaluate and Adjust — Don't get stuck in a rut. Just as with physical exercise, mental work-outs have to be adjusted periodically to remain effective and interesting. The best tip? "Don't wait to start, and don't give up hope. There's no cure for Alzheimer's, but maintaining your brain is the best way to slow decline, regardless of age," said Sanborn. "At Belmont Village, we've seen improvements in residents with early and even mid-stage loss as they became more active in our programs." For more information about Belmont Village Senior Living call (502) 721-7500 or visit belmontvillage.com. 70 LOUISVILLE MAGAZINE 8.13 Presbyterian Homes of Louisville — an Aging in Place Community The Presbyterian Homes of Louisville community includes more than 200 trained professionals who view their work as more than just a job. For them, it is a ministry of service to others. That's why many have provided their services for more than 25 years. Presbyterian Homes of Louisville offers a continuum of care — a true aging in place community — with three buildings on one campus: Westminster Health & Rehab Center is a fully licensed, skilled nursing facility providing multiple levels of aroundthe-clock care, from short-term and rehabilitation stays to long term care. They have a dedicated transitional care unit featuring private and semi-private rooms. This unit is an interim step between the hospital and home, to help the individual better understand their medical condition and to receive therapy and education on-site. Therapy is also available on an out-patient basis. 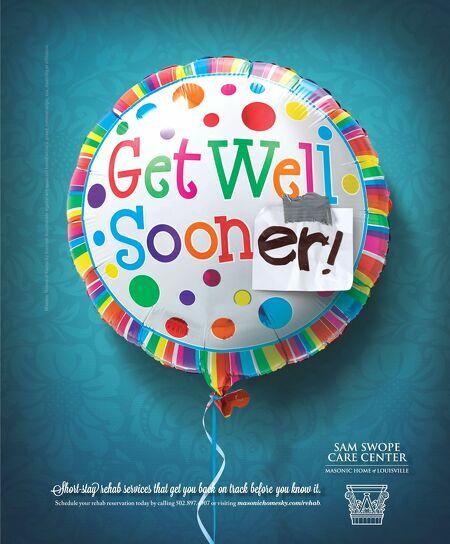 Most insurance plans, Medicare and Medicaid are accepted. Rose Anna Hughes Home features both assisted living and personal care apartments. Assistance with activities of daily living and medication management is available. Westminster Terrace Assisted Living features spacious apartments with a variety of foor plans. This environment allows seniors the independence they desire, with the security of knowing that assistance is available if they need it. Presbyterian Homes, located off Bardstown Road, two miles south of the Watterson Expressway, is a not-for-proft, faith based community that has been caring for Louisville's senior community since 1947. All residents enjoy a fulflling lifestyle in the park-like campus, with a complete activities program, chef-created meals, social work services, chaplains, and on-site church services. Visit Presbyterian Homes of Louisville online atphsk.org or call (502) 499-9383 for a tour.